Our old friend Steve Rutner, profiled in the magazine way back in 2010, has made us all proud. Dr. Rutner, a professor of supply chain management at Texas Tech University, just earned a salute from the nation, particularly those in military uniform. When not an academic, Professor Rutner serves in the U.S. Army Reserve and the Alabama National Guard. On July 1, he pinned on a star and became Brigadier General Rutner. Rutner originally trained as a tanker, but along the way, the Army Reserve discovered that its armor officer had picked up a Ph.D. in logistics and transportation at the University of Tennessee and adjusted its plans for him. After that call, he began his second career in the military, now as a military logistician. 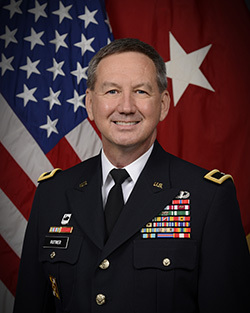 Today, Brigadier General Rutner is the deputy commanding general of the 84th Training Command located at Fort Knox, Ky. His unit is responsible for the collective training of approximately 200,000 U.S. Army Reserve soldiers and their units. In peacetime, his team trains logistics and transportation (sustainment) types of units in exercises all over the U.S. But if the curtain goes up, the team could potentially be deployed to run military port operations anywhere in the world. Now at the pinnacle of his profession, Rutner is still at heart the soldier who served as a tanker through the Cold War and up to Operation Iraqi Freedom. When congratulated before the promotion ceremony, he was quick to point to a senior NCO (non-commissioned officer) standing at the back of the room, noting that it was the senior master sergeant, not he, who deserved the credit. Feedback: What did you think of this article? We'd like to hear from you. DC VELOCITY is committed to accuracy and clarity in the delivery of important and useful logistics and supply chain news and information. If you find anything in DC VELOCITY you feel is inaccurate or warrants further explanation, please ?Subject=Feedback - : Tank officer rises to run Army logistics unit">contact Chief Editor David Maloney. All comments are eligible for publication in the letters section of DC VELOCITY magazine. Please include you name and the name of the company or organization your work for.